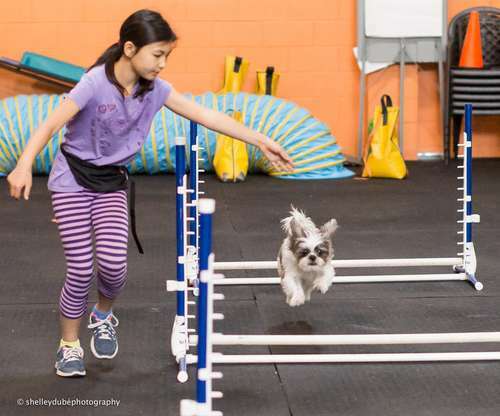 This program is designed for kids and their dogs. This is an introduction level of agility. The participants will work on and off leash control. Dogs will be introduced to jumps, tunnels, wobble boards, ramps and the pause box. As the handlers and dogs progress so will the obstacles and difficulty. Children will learn how to run a course and sequence obstacles. Children will also be instructed on dog body language, what is a reward, how to play in a fair way with their dog. No aggessive dogs will be permitted. Please review the following Terms and Conditions prior to registering your child for the DOGSmart Training Agility for Kids and Dogs. Participants are required to bring a small snack to eat during breaks on every day of the program, as well as a bottle of water to remain hydrated. IMPORTANT: All DOGSmart Training programs are nut-free. Please do not bring any snacks, food products, or dog treats that contain nuts due to potential nut allergies. All participants must wear appropriate and comfortable clothing suitable for running and general exercise. No loose clothing with materials and/or drawstrings that dangle. It is recommend that participants wear runners or similar flat shoes. No flip flops, heels, cleats, or platform shoes. These requirements are for the safety of all participants and their dogs. One parent or guardian is welcome to observe classes at any time and is welcome to stay with their child for the duration of the program. However, please note that parents/guardians are unable to participate in program activities and should refrain from directing their child or making comments in order to maintain a distraction free environment. This also allows participants to focus on the work they are doing with their dog while listening to the instructor’s feedback and instruction. Parents and/or legal guardians are required to sign a liability waiver form on the first day of the program when dropping off their child. Please arrive at least 15 minutes before the program’s start time to complete the necessary paperwork. Children are unable to be dropped off or participate in the program if these forms have not been completed prior to start. Refunds will not be issued in the event that a child misses any classes for this reason. If the parent/guarding is unable to attend on the first day during drop off, please call us and arrange to complete the paperwork in person at the DOGSmart Training facility well in advance to ensure your child is able to attend. Only legal guardians are permitted to complete required paperwork. Parent/Guardian(s) are required to inform DOGSmart Training as well as the instructor on the first day of the program all necessary information needed to properly care for their child including any information about allergies or other conditions. Instructors and staff are unable to administer any medication to program participants, and parent/guardian(s) will need to make other arrangements if necessary and are welcome to stay for the duration of the program. If a child becomes ill or injured, DOGSmart Training will contact the emergency contact listed on the registration form and call for emergency services if necessary. Parent/guardian(s) must ensure that the emergency contact listed on the registration form is accessible by phone for the duration of the program. DOGSmart Training is not responsible for lost or stolen property. Participants should not bring any valuables with them to camp. Parents/guardian(s) should ensure that their child has all of their belongings with them before leaving each day. Any lost articles not claimed within 30 days of the program’s start date will be donated to charity. Parent/Guardian(s) are required to check in their child when dropping them off at the beginning of each day, and check them out before leaving the premises. Please note that children will only be released to the parent and/or guardian listed on the registration form unless prior arrangements have been made in writing. Parent/Guardian(s) are responsible for informing the instructor and staff about any special pick-up or drop off arrangements. DOGSmart Training strives to create a safe and fun environment for all its clients and summer program participants. As such, DOGSmart Training reserves the right to dismiss any child from a program for any reason that it believes compromises the safety, comfort and/or enjoyment of other program participants. This includes but is not limited to; participant’s inappropriate or aggressive behaviour or language towards their dog, staff, instructors or other participants. Refunds are not provided in these circumstances. DOGSmart Training takes photos of its programs and its participants to share all of the fun and excitement that happens! Participants of summer camp programs will be given one to two digital photos that they are welcome to keep, use or print for their own personal purposes. There are no additional fees for this and is a great memento of your child and dog’s time at camp! DOGSmart Training may also use these photos for promotional purposes including its website and social media. By registering your child and dog into a program at DOGSmart Training, parent/guardian(s) agree to photos being taken of their child, and will need to sign a photo release form on the first day of the program. If you would prefer not to have photos of your child taken, please inform the DOGSmart staff prior to the start of the program. All dogs must be 9 months of age or older with two sets of vaccinations in order to attend the program. Aggressive or reactive dogs are not permitted in summer camp programs. Should a participant’s dog be deemed aggressive, reactive or unsuitable to attend summer camp for any other reason, DOGSmart reserves the right to dismiss the participant and their dog from the program. Refunds are not provided in these circumstances, however may be considered in special circumstances where a dog is unable to participate and at the discretion of the program’s manager. Parent/guarding(s) are required to inform DOGSmart Training and the instructor on the first day of the program of any important medical conditions or allergies that their dog has. Dogs must be in good health in order to attend the program. Please call us for more information prior to registering if you are unsure about whether or not your dog is able to attend, or would like more information. Participants are required to bring two small bags of bite-sized, non-crumbling dog treats with them to each class which will be used throughout the program. Treats can be purchased at the DOGSmart retail store on the first day of class, or other pet stores before starting the program. Please call us for recommendations if you are unsure what types of treats to bring. A treat pouch is suggested, but not required. Please equip your dog with a flat buckle collar, front clip harness, or head-halter only for all classes. All other types of collars including pinch, choke, martingale and shock collars, as well as retractable-leashes are not permitted. Cancellations must be received no later than 7 days prior to the first day of the program. We are unable to issue refunds for cancellations received less than 7 days prior to the program start date or after a class has started. Due to the nature of agility programs, we are unable to provide make up classes or refunds (full or partial) for any missed classes.